Celebrate the Color of Green! 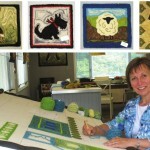 The Wild Hare Rug Studio promotes making rugs using different methods. We are always looking for more artists to help teach. If you would be interested follow here. 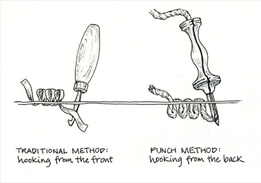 The Oxford punch needle guides the punching process and assures that your loops of yarn will be even and uniform. Wool strips may be used in the punch needle too. Combining both fibers in your project adds interest and texture. You will find punch needle rug hooking to be very calming. It is stress free. Once you are comfortable using the needles you will be "painting and drawing" with yarn and enjoying being creative. Our beginning class will teach you all of the basics you need and one class will allow you to begin to creating beautiful rugs, pillows, chair pads, purses, and foot stools. If you have an idea for a project you would like to make, please let me know. We can help you design the image and help create the color palette.